The unpredicatable anomalies that can plague live performances are aleviated by one thing, and one thing only. That thing is prolonged, intense and regular rehearsals. For months now Dayglo Fishermen have been doing just that. The date of the band's next concert on 26th March 2011 is approaching fast, and the dedication and perfectionism that permeates each member ensures that nothing is left to chance. 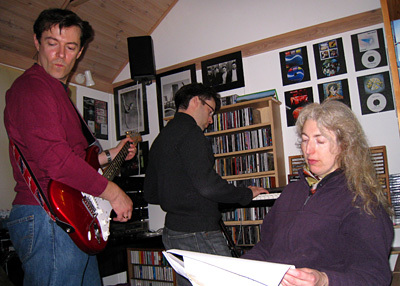 Seen below, Dayglo Fishermen's core members, Peter, Richard and Ginny, are melding well as their collective performances are tightened, ensuring that on the night their perfomance will be that of a single entity - a symbiotic output of sound, style and movement. Dayglo Fishermen concerts are rare events, and it's quite possible that this may be their last. For that reason alone it's essential that anyone with a even remote interest in the band's music is there. Contact the Limelight Theatre, Aylesbury, on 01296 431 272 to book your tickets now.